To measure sequential read and write performance I created an iometer test script to read and write 2MB files to the drives. The writes are 100% sequential and are performed on an unpartitioned drive for 3 minutes. Performance is reported in MB/s, higher numbers are better. The sequential read performance of the latest generation of SSDs is nothing short of amazing. 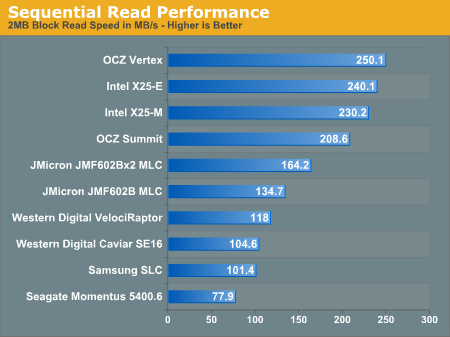 The OCZ Vertex pulls through with 250MB/s, over twice the speed of the VelociRaptor and 2.5x the speed of the Samsung SLC drive that OCZ used to sell for $1000. Looking at write performance we see things change a bit. 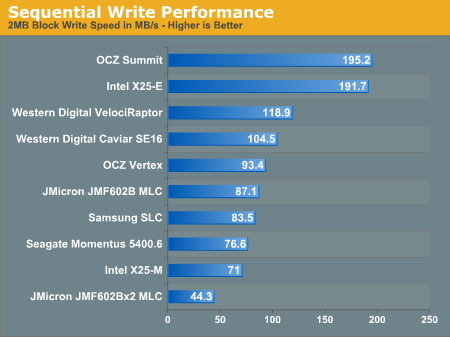 The OCZ Summit and Intel X25-E are the only two drives that can outperform the VelociRaptor, and they do so handsomely. The rest of the drives fall below even the 7200 RPM Caviar SE16. They are by no means slow, they just don't destroy the fastest hard drives as they do in other tests. While the X25-E should perform the way it does, the OCZ Summit uses MLC flash yet it performs like an SLC drive. This is a very important benchmark as it shows the sort of performance Samsung has optimized for with its controller. This drive is designed to shatter bandwidth barriers, but what about latency? How do these drives fail? I have heard that they will just suddenly die, no more writes or reads possible. What I would like to know is what happens when it dies? Do you lose all data? Just can't write anymore? How does the OS respond? Any early warnings? What about e.g. CRC? How does possibility of data corruption compare to traditional SSD? What about RAID? Since the drives are electrical, not mechanical, this reduces the number of failure vectors and environmental concerns (e.g., ambient temperature over lifetime of the drive). Won't SSDs therefore fail closer together in time in a RAID configuration? This reduces the window of opportunity for fixing an array and also decreases the applicability of RAID, however marginal. I need to run HDDErase on an X25-M. No matter what bootable CD or flash drive I create, HDDErase does not see either of my SATA hard drives. I already disabled AHCI in BIOS. Also, I am using version 3.3. I know that 4.0 does not work with the X25-M. Regarding the shill tshen83 who claims that Anandtech cost the drive manufacturers millions of dollars in sales. If that is true, Anandtech has saved customers millions of dollars. Anandtech should care more about their readers losses than drive manufacturer losses. If Anandtech was a site for drive manufacturers and their shills we wouldn't be reading it. To me, if the SSD drive manufacturers lose money, it's their own fault for building crap that has higher write latencies than old fashioned drives with metal discs spinning at 7200RPM or slower. Not anandtech's. I can get higher sequential reads and writes by using RAID on old fashioned drives. It is much harder to get lower latency. So Anandtech did the right thing for OCZ. Lastly, there might be a way of making your windows machine stutter less even with a crap SSD. Note: I haven't tested the actual effect on an SSD because I don't have an SSD. Basically by default when Windows accesses a file on NTFS, it will WRITE to the directory the time of the access. Yep, it writes when it opens files and directories (which are just special files). That might explain the stuttering people see. For a lot of things, Windows has to open files. Warning! There are reasons why some people or programs would want to know the last access time of files. Me and my programs don't (and I doubt most people would). "SSDs have +5 armor immunity to random access latency"
Great article! I respect that OCZ made the necessary changes to make this drive work. I'd rather take a slightly slower drive if it meant consistent performance. If my hard drive started to stutter I'd flip out! I'm glad that they took the feedback and instead of selling faulty drives, that would ultimately hurt their brand, they decided to go back to the drawing board and iron out the kinks. I'm not expecting them to compare to Intel's 25-M per price or performance. They don't have nearly the cash or manufacturing capacity to compete with Intel but they do have that small business feel with receiving feedback and making improvements, which is important to customers.